Not even a full day between the release of the Starter Set to premiere retailers and the general release of the Basic set online Frog God Games has released a decent-sized adventure for 5e. 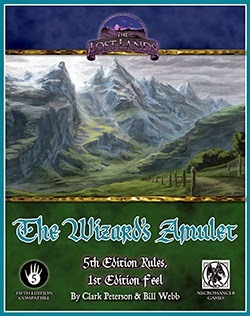 The Wizard's Amulet is a 28 page fully load adventure with art, new monsters and a well developed romp. The thing is, the adventure isn't important, its release under OGL (page 26) is. If the adventure remains up for either free or eventual sale it will mean that 5e is under the same rules of as 3.x allowing other developers to create, develop and supplement the newest edition of the game. I wait with bait breath to see what happens next. Also, I love the 5th edition compatible logo. I hope it sticks!